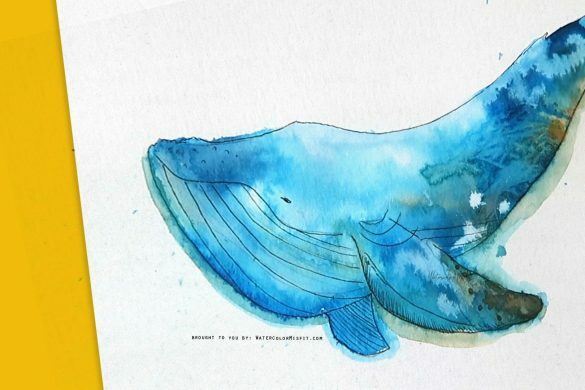 If you are like me, you’ve grown up with watercolor. I remember as a child – first being introduced to the art form through children’s book illustrations. So naturally, I wanted to learn this exciting art form at a very young age. However, my enthusiasm waned upon walking down the aisles of numerous supplies at my local craft store. The amount of supplies available was daunting and to make matter worse – I had no guide as to what I actually needed. Now, this list is NOT COMPOSED OF THE CHEAPEST OPTIONS AVAILABLE. 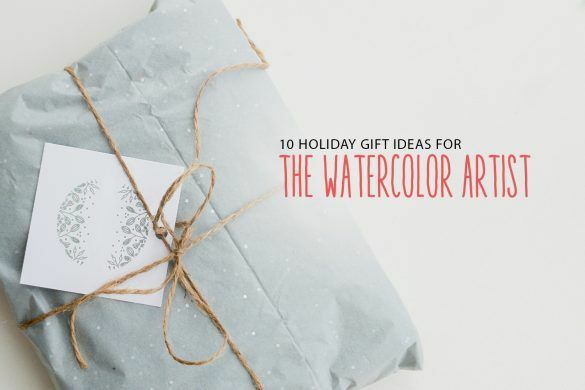 Rather it is a list of items that I BELIEVE WILL MAKE YOUR EXPERIENCE WITH WATERCOLOR EASIER AND MORE ENJOYABLE. 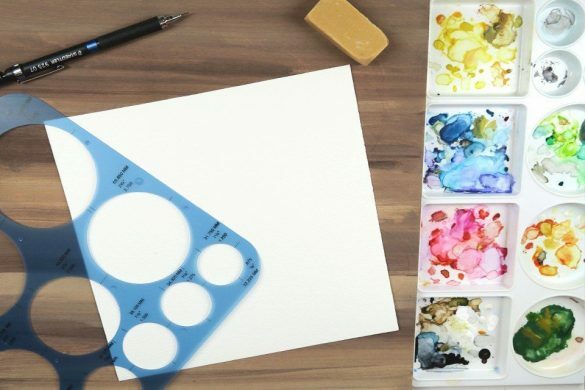 Let’s be honest with ourselves – WATERCOLOR ISN’T EASY – so why make our lives even harder by using supplies that don’t live up to our expectations. 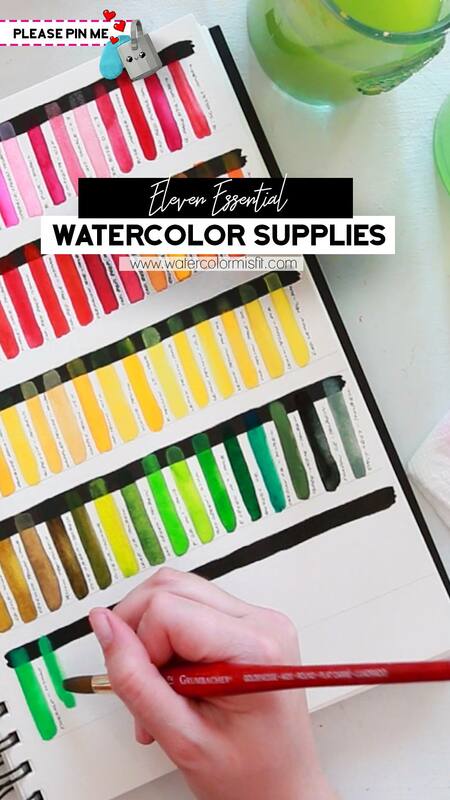 Eleven watercolor supplies that will make your life easier when starting watercolor. The brands I recommend are Strathmore Mixed Media size 5.5in by 8.5in (my travel sketchbook) and Canson XL Mixed Media Hardcover size 9in by 12in (my heavy duty artist sketchbook). Both of these are spiral bound – which I prefer over the book bound types. I have to admit -for years I’ve used my basic #2 mechanical pencils from school – you know those cheap one’s you can get just about anywhere. But for those of you wanting to level up your sketch skills – I recommend the Pentel GraphGear 500 Automatic Drafting Pencil Black (PG525A). It’s a mouthful – but I love it. It has a really hard lead and a small tip – making it easy to create fine intricate lines. I recommend a Sakura Pigma Micron Blister Card Ink Pen, Black, SIZE 005. Believe me or not – this stuff is AMAZING! So be sure to pick some up in the future – if you haven’t already done so. I currently own a cheap Target brand of tracing paper – which works fine for my purposes. Basically any brand will do – just be on the lookout for something that doesn’t tear easily and you can see through relatively easy. I personally own a very large size 23in x26in and a slightly smaller size 14in by 18in. Recently, I’ve been using the larger one which is perfect for pouring methods. Recently I’ve been experimenting with a new brand – called Pacific Arc Drafting Tape. 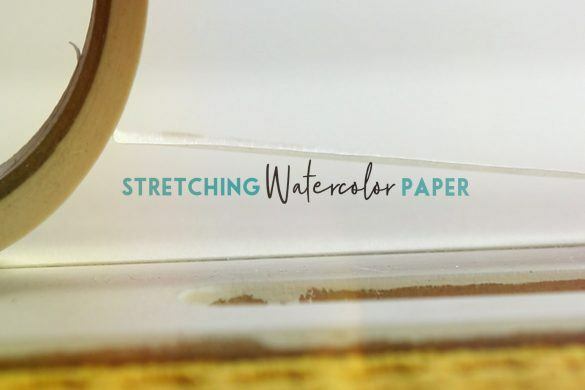 Due to quality – in my opinion it is a much better quality of tape compared to masking tape – which tends to rip and tear my watercolor paper – NOT COOL MASKING TAPE! NOT COOL! I recommend the Mini White Porcelain Square Tasting Plates, Set Of 8 from World Market for $5. 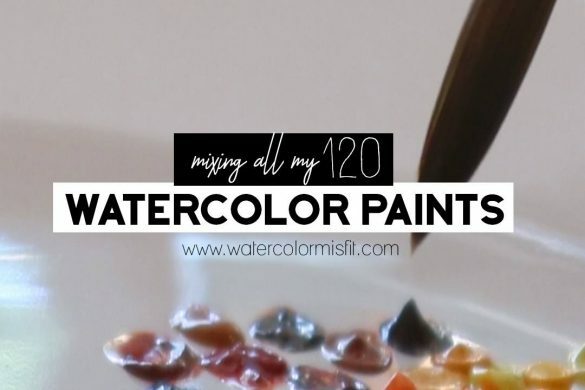 These are just the right size for mixing up large washes and reusing them for later use – thus not wasting precious paint. Brushes are another watercolor supply that can be super intimidating. If you are just starting ROUND brushes (or brushes that come together to form a nice point) will be your best friend. 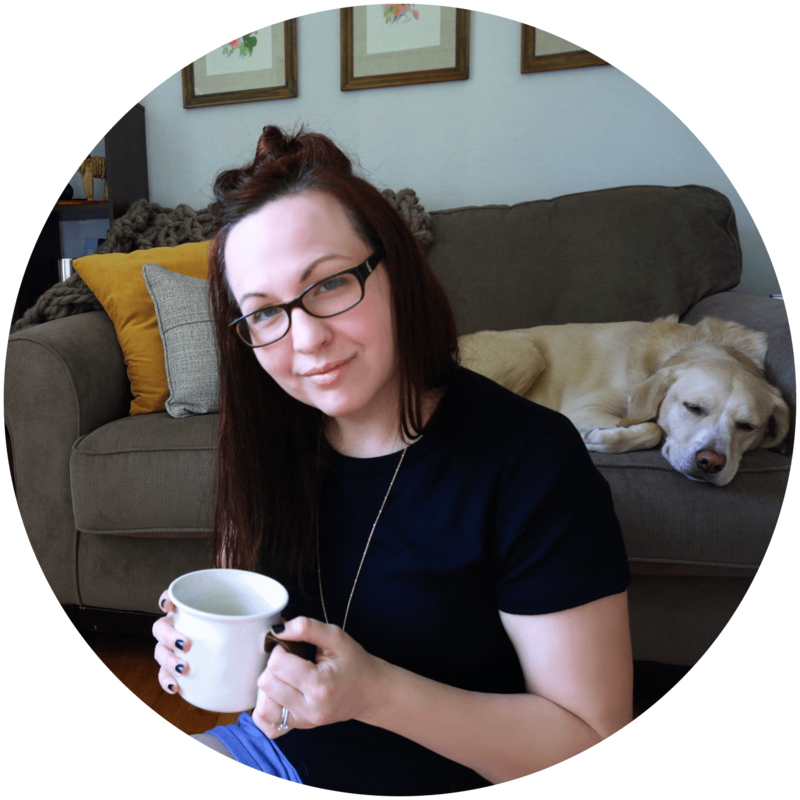 I use primarily round brushes even to this day – although I own an assortment of kinds, brands, and sizes. But your go to brushes are usually ROUND BRUSHES size 4, 6, 10, and 12 plus a large FLAT BRUSH size 2in (for large backgrounds). These are great starters – but if you would like o add even more to your creative stock – Make sure to pick up some liner brushes size 1, 00 and 0000. These are great for fine details in a painting. I recommend Winsor and Newton University Series Brushes – but if you really want to invest in a quality brand – I recommend Grumbacher. It is by far my favorite watercolor brush brand as of yet. I’ve linked my favorite brush below the size 12 Grumbacher Round. 🙂 If I could only use one brush it would have to be this one. 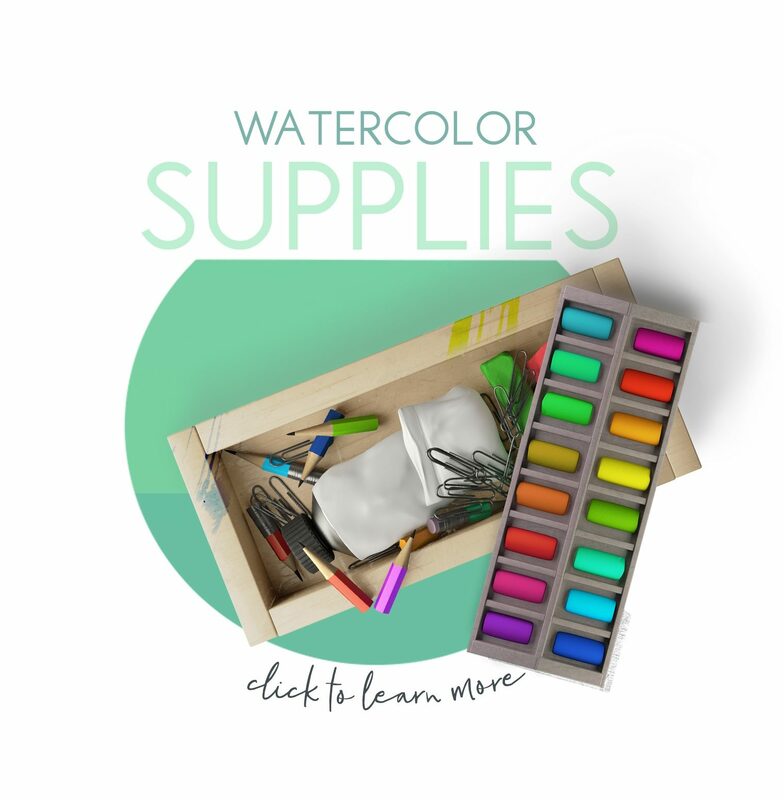 And finally – we are on to the most crucial supplies of any watercolor supply kit! The Paint! 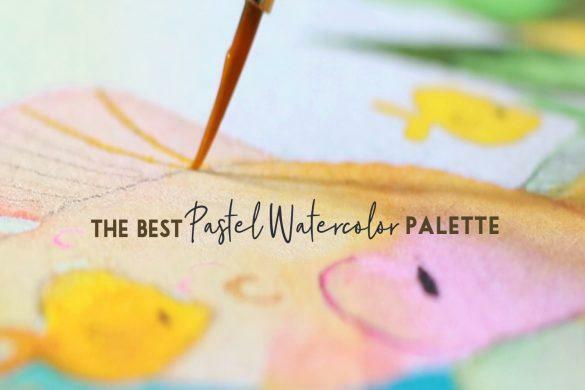 Watercolor paint is perhaps the most overwhelming option simply because there are SOOO MANY OPTIONS! Personally, I highly recommend using tube paint – if you desire bright vibrant watercolors for your paintings. Tubes (even in student grade) can be forced to be more vibrant and intense of colors (compared to their pan counterparts). The Student grade of cheaper in quality tube paints that I recommend are Winsor and Newton Cotman series. Other cheaper versions I recommend are Holbein Watercolors Tube Paints and Kuretake Gansai Tambi StarryColors (which are pans but I use these for accents in my painting). 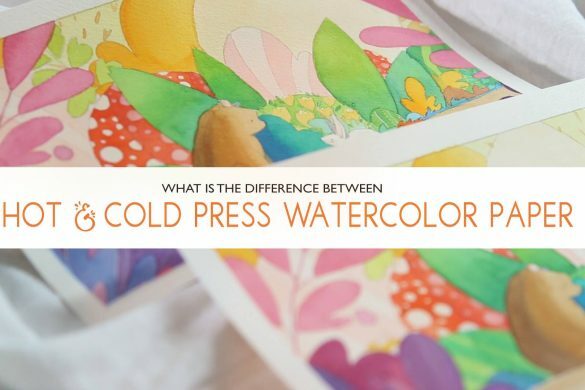 Also I would like to note that the last two brands are Japanese products – which tend to lean more to opaque solid color watercolors – compared to western brands which are more transparent in nature. Thus these two brands can appear chalky due to their structure – but the color selection is amazing – especially if you like pop neon colors – which Holbein is characterized for. As for artist grade paints – my go to brands are Winsor and Newton and finally my new favorite Schimincke which is also know for it’s unbelievable bright and intense watercolors. And finally – let’s talk paper! Paper is crucial when learning to paint with watercolor – Because of this I’m picky about my paper. Arches has been my go to paper for years now and there is really nothing comparable. However, that being said – Arches can be really pricey. 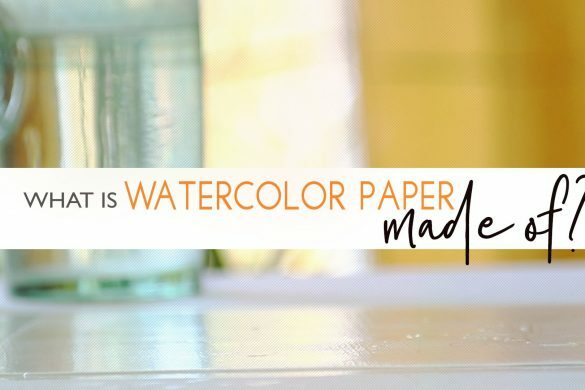 So here are some other options that I recommend for cheaper watercolor paper – Bee Paper Cotton Cold Press Watercolor Paper Pack, (make sure to purchases the thicker version). Keep in mind, that the quality of your supplies will ultimately lead to your project being more enjoyable, easier to work with, and produce a better quality result in the long run. This is why my list features some more expensive artist grade options. If you are desiring to paint a piece that will last – you have to buy the products designed to do just that – last. Thank you so much! I love knowing what supplies my favorite artists find works best. It definitely helps since there are so many different brands and overall supplies to purchase. The additional links in your article are missing though and I would love to read more about porcelain over plastic as well as the insight on tracing paper. What a nice list. I love your way of making the complicated not so complicated. I think I’m going to have to hunt down that pencil. I’m hoping it comes in a variety of harder leads as I tend to be too heavy handed with softer leads and yeah, in my ham fist the standard HB can be too soft and leads me down the road of lines that are hard to erase. I wanted to say I love your work. Not only do I enjoy watercolor but I quilt too. Buying fabric is one of the most enjoyable parts of quilting, and I think your art work would make beautiful fabrics. Art Gallery fabrics is one of my favorites. They have a website with look books for inspiration. Moda is another. If you go to spoon flower.com you can see what your artwork looks like on fabrics and people can purchase your artwork printed on fabric from You on spoon flower. I can see you as one of the designers for Moda..or art Gallery fabrics… just a thought! God Bless! Total newbie here! So yes, more info on the tracing paper, what’s it for? Side note, my dad was in at school eons ago.. like 50 years ago.. and when I mentioned I was enjoying watercolors he escaped to his workshop and presented me his WATERCOLOR SET. kid you not, 20+ tubes of paint (that still work! ), Probably 15 brushes (mostly Grumbacher! ), An enameled porcelain moving tray, paper books, and some pieces he had done in school. I ’bout died. I figured someone here would understand my excitement! When I first showed an interest in painting in my late teens my mother presented me with her old kit of oils . Probably 40 years old! I didn’t try to use it til 20 years later because I was into acrylics. But when I did everything still worked. More or less. ? I still really never got into oils. 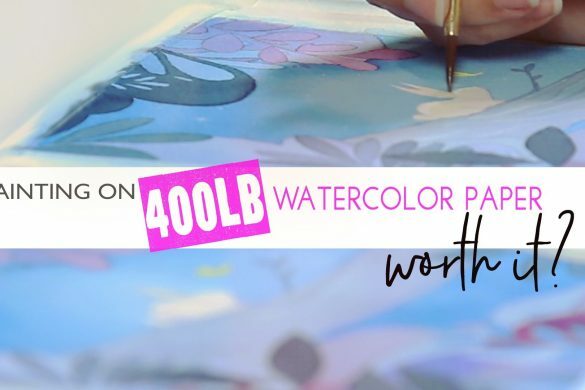 Now I’m taking an interest in watercolor, and found thisnlist to be very valuable, indeed! Happy painting! I just LOVE those Graph Gear pencils! I recently got an new one that is from the 1000 series. The “pocket” clip is an alligator clip that will retract the fine metal tip up inside the barrel. Very cool. Hi from Ontario, Canada..Enjoy watching your video’s . They are fun and full of great ideas. Thanks for all you do. thank-you!!! so much for all you have taught, sooooo much to learn! I just moved to a beautiful part of the Hudson Valley. I enrolled in your class about three moths ago to learn how to paint the fox. I now will finally stop unpacking boxes and paint! I so enjoy your vids on YT. I love your style drawing animals and your art is beautiful.